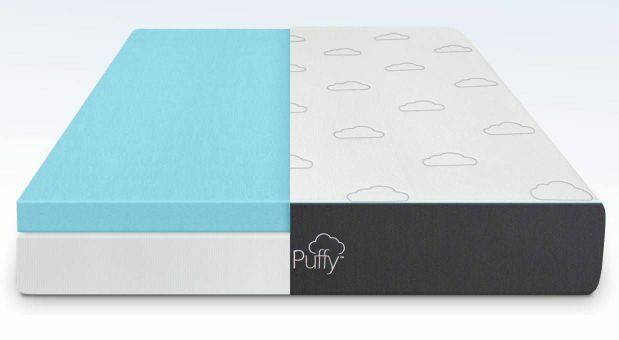 Puffy isn’t just a mattress, it’s a cloud you can sleep on. Especially with the updated construction in early 2019 to adapt and contour to your body even more. Not only does the patented design give you the ultimate comfort, but also sleeps cooler too. With 8x more air flow than standard memory foam mattress brands you get the benefits of true memory foam without the heat retention. This advanced technology allows for optimal cooling as well as ideal pressure relief. Making the Puffy Mattress one of, if not the most comfortable memory foam mattress under $1000 available. Make sure you use our discount link below the video to save $250 too! The materials and construction of a mattress give you a good look at not only what to expect in terms of feel and comfort. But also benefits, longevity and durability. Understanding what makes up a mattress is a good place to start. It allows you to really understand how those materials effect your sleep and how the mattress should perform. 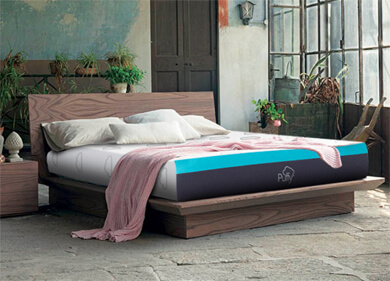 The original Puffy bed is a 10 inch memory foam mattress made up of three layers. Each of these layers lends itself to ideal comfort in various ways. 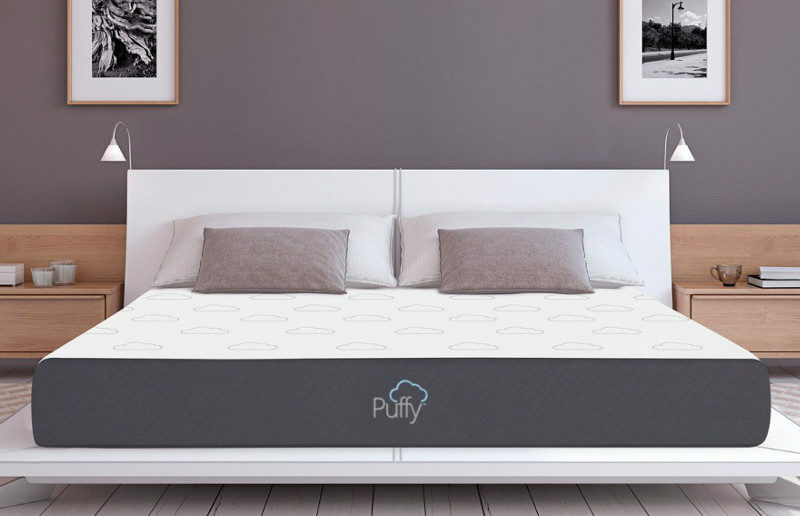 The Puffy mattress is offering in one universal comfort, so the materials and construction will be consistent across the board. Below is a deeper look into each layer of this mattress and how they work. The top layer is a 2 inches of 2.5lb density patent pending Cooling Cloud Memory Foam. This foam is infused with gel increase air flow 8x more than the average foam mattress. It also uses convection and conduction to pull heat away. Making sure that this memory foam mattress never gets too hot and stays temperature neutral all night. This memory foam layer is also very adaptable as well as pressure relieving. With any memory foam mattress the appeal comes from the contouring and cocooning feel that allows your body to sink down in all the right spots. The top layer of Cooling Cloud foam makes the Puffy mattress just soft enough to let you sink in, but still dense enough for plenty of support. In early 2019 Puffy made an addition to the original Puffy Bed with a middle layer of transition foam. This new layer is 2 inches of ClimateComfort Memory Foam. This allows the mattress to be an even more adaptable and comfortable surface. By adding deep comfort with just a bit more softness than the top memory foam for even better pressure relief. It is dense, yet pliable making for a supportive layer that elevates your Puffy mattress sleeping experience. This layer is also beneficial for sleeping cool. This added layer is temperature as well as humidity resistant. This helps keep the mattress from sleeping too hot and also helps keep it dry too. This helps from interrupting any sleep with unnecessary heat or wetness. The bottom is 6 inches of 1.5lb density Firm Core Support Foam. 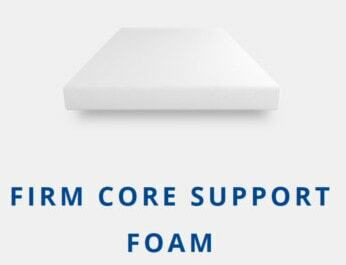 This foam is the foundation of the mattress and provides stability, strength and support to ensure durability and longevity of the Puffy mattress. This layer uses Insta-Firm technology that makes this base foam 99% more responsive and 4x more supportive than standard foams. Giving each sleeper proper spinal alignment and ideal sleeping posture, regardless of your preferred sleeping style. It also consistent and sturdy allowing the comfort layers to perform optimally and keep you from sinking in too far. This mattress is covered in a removable cover that can be unzipped and washed when needed. It is also stain resistant, so anything that does happen to spill on it won’t stain the bed. The top is stretchy and soft and fits nicely to the mattress. It even has a very appropriate and aesthetically pleasing cloud pattern that really adds to the look. The side panels are a dark gray durable fabric that compliment the mattress as well. Even the cover showcases the detail towards design and function. With the Puffy Mattress you can quickly see from the material and construction that you will be getting a truly great memory foam mattress. But what does that translate to for sleeping? Below we will go through how the Puffy will feel as well as perform in several categories. Giving you a better idea of the comfort and firmness for side, back, stomach and combination sleepers. And even how it will work for big and tall sleepers too. We will also go through the details of how it will work for isolating motion, sleeping cool and even the edge support while sleeping or sitting on the Puffy bed. Though this mattress is a memory foam mattress it has several areas that set it apart from most other all foam mattresses. Keep reading our Puffy mattress reviews to see all the benefits this bed has to offer. When it comes to Puffy bed reviews the comfort may be the most important aspect people are looking at. The Puffy mattress is offered in one universal comfort. This approach focuses on one ideal feel that will appeal to the vast majority of sleepers. Puffy has done a great job of finding a feel that creates an almost perfect mattress for every sleeping position. Making this mattress one of the best all foam mattresses under a $1000 that provides an ideal combination of comfort and adaptable support. Another great quality of the Puffy mattress is its ability to alleviate pressure points. This gives your body plenty of pressure relief for a completely restful night. It also has memory foam that has just a touch of responsiveness. This is great for never feeling stuck and allowing you to easily change positions. This mattress should appeal to most sleepers and has a medium-firm feel falling around a 6 to 8 on a firmness scale of 1-10. 1 being the softest and 10 being the firmest. This range is subjective and will depend not only on your size, but your shape too. Below we will go through just how the Puffy works for all sleeping positions and how it adapts accordingly. It will be a great compromise of contouring comfort and responsive support. The best part about the updated Puffy mattress is how it now feels while sleeping on your side. The added layer of deep comfort memory foam has added a lot when it comes to having just enough softness to be truly comfortable for side sleepers. Your shoulders and hips will have no problem sinking in. And you still have plenty of support for good ergonomics. The really nice thing about this memory foam mattress is not only how adaptable it is but also slightly responsive. You never feel like you are stuck and can easily change from side to side. Something that sometimes is hard to do on slow responding memory foam beds. If you’re a back sleeper you are sure to like the feel of the Puffy. The pressure relieving foam layers create an ideal feel that evenly distributes your weight. While also supporting your neck and shoulders for ideal posture while sleeping. The mattress contours to your body and adapts to every inch for precision comfort. The firmness level is spot in. Making it dense and supportive enough to keep you from sinking in. But just plush enough to be comfortable and cradle your body. Sometimes you need to compromise with feeling “in” the bed or “on” the bed and with the Puffy, you don’t have to worry about it either. The feel is perfectly balanced, especially while sleeping on your back. The great thing about the Puffy as that if not only works great for back and side sleepers but also is ideal for stomach sleepers too. The foams are dense enough to give you plenty of support and keep your back from bowing. With a mattress that is too soft you could cause problems for proper alignment, as well as aggravate back pain or sleep disorders. 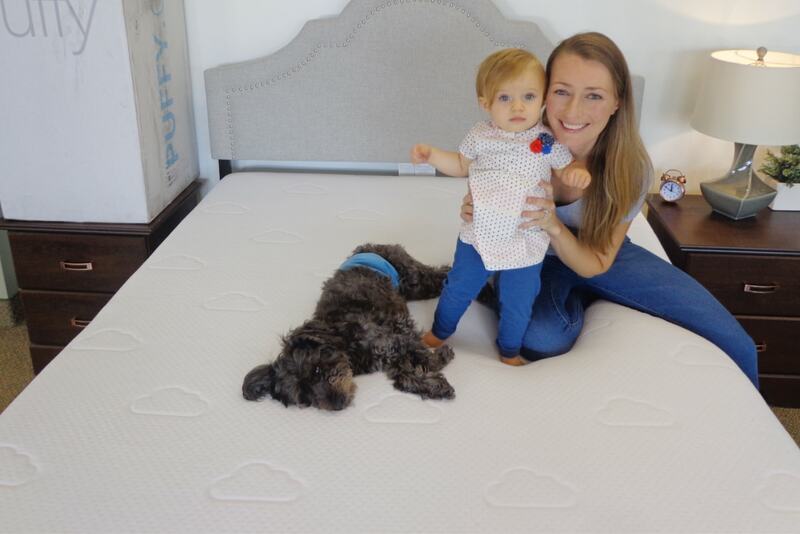 But, the Puffy’s patented memory foam layers have plenty of structure to keep you ideally aligned while sleeping on your stomach. This mattress pushes back up where it needs to and sinks in where necessary, to make sure that you are comfortable in any sleeping position. Clearly combination sleepers will have no problems when it comes to the adaptable comfort of the Puffy mattress. This bed is made with all sleepers in mind so regardless of which sleeping position is best for you the Puffy bed adapts. Making this mattress a great choice for couples who have a hard time trying to find a balanced mattress that will work for multiple needs. The Puffy mattress even does a good job for accommodating the larger and heavier sleepers out there too. This mattress is a true medium-firm feel that offers plenty of support with the durable yet pliable memory foam. It may feel a little closer to a medium feel the larger you are, but it will still offer everything you will need to sleep well. The addition of the middle layer of memory foam also adds to the deep comfort for plus size sleepers too. This ensures that you won’t feel the base foam when you sink down into the comfort layers. Making it more appealing. The only thing I would avoid as a larger sleeper is sleeping on your stomach. Otherwise, the Puffy would be a great option for sleeping on your back and even side. We were pleasantly surprised with the support and adaptive comfort that the Puffy mattress provided. We noticed it to be right in the middle of the firmness level Puffy suggestion. Which was right around a 6.5. Making it an ideal medium-firm feel. This was perfect for both of us, since it was just a bit firmer than a medium. Allowing us to comfortably sleep in all positions. The memory foam mattress top layers feel like a true dense memory foam that is contouring and hugging. The memory foam layers are a little slower responding. However, for a memory foam bed, you never felt stuck allowing you to easily move. The firm base layer gave plenty of support that is durable and long lasting. Overall we found this all foam mattress to be an ideal comfort that really did adapt to our bodies and sleeping preferences. For the price of this mattress you really get an amazing bed for the cost. Make sure to save even more with out exclusive Puffy discount code below too! Like many all foam mattresses this bed will have very little vibrations caused by movement. The foams should absorb the majority of vibrations and makes for very minimal to no motion transfer to be felt. This mattress in particular would be great for anyone who shares a bed and is concerned about waking their partner. The Puffy mattresses foam layers really do a great job of eliminating any motion. he dense memory foam absorbs almost all motion instantly. Creating optimal motion isolation. 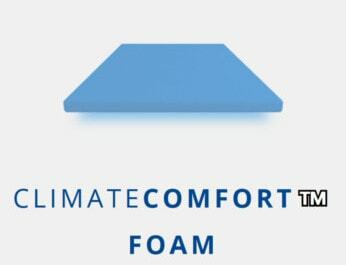 While the base foam quickly and readily eliminates any movement that makes it beyond the thick top layer of memory foam. making for little, if any, disturbance when getting in and out of bed and moving around, even for a light sleeper. The Puffy mattress incorporates cooling technology in every material of this mattress. 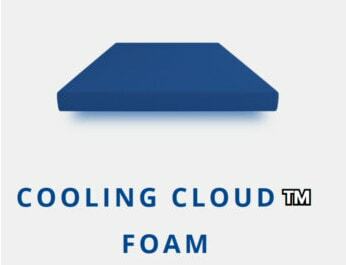 The top layer of memory foam layer is a patent pending cooling cloud foam that uses convection and conduction to dissipate heat and keep it away from the body. It’s also infused with gel that increases the airflow 8x more than standard foam mattresses. The base foam is dense and supportive to create a solid base that won’t allow you to sink into the mattress and keep you closer to the surface where less heat will build around the body. The cover is also breathable to aid in keeping cool. All of this allows for the mattress to maintain an ideal temperature while sleeping. Even the cover adds a level of breathability that improves the feel and temperature neutralization of the bed. Having cover that is not only soft but aids in the ability for air to flow and heat to dissipate will emphasize the other cooling properties. Giving the Puffy a feel unlike most heat retaining memory foam mattresses. Edge support may not seem like an important topic for some sleepers. However, if durability, wear and function are important to you, than edge support is a valid area to review on a mattress. The materials and build of the mattress will directly impact the edge support. The higher quality and more durable materials the better edges. And the layering process and consistency of feel will ensure proper and fully use of the bed. When it comes to the edge support on the Puffy mattress there are two areas to consider. How well the edge support performs while sleeping as well as while sitting. The most important aspect will be while sleeping, but many of us also occasionally use the edge of the mattress to sit on too. When it comes to sleeping you will notice that the Puffy will allow for complete use of the sleeping surface. The consistency and density of the foams will create a smooth and stable surface. Allowing for fully usable edge to edge use. The perimeter is solid enough to sleep right up to the edge and the variance in feel will make for sleeping on the edge or middle feel no different. The other area of interest is sitting on the edge of the Puffy mattress. Though sleeping it does a great job from an edge support standpoint you may have a bit less support while sitting. Though this mattress does better than most all foam mattresses, it still won’t have the sturdy feel of foam edge encasement or reinforced coils like hybrid or innerspring mattresses offer. 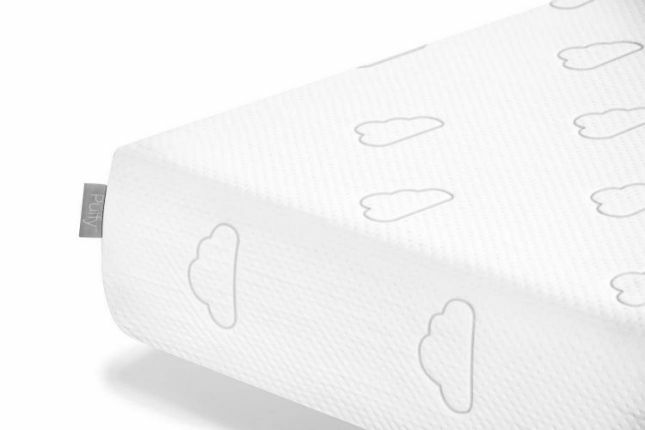 Sleeping on a cloud was never so easy! For a balanced and adaptable memory foam bed that will last for the long haul, the Puffy is a great option. The Puffy mattress is priced at $1,150 for a queen size. And ranging between $795 and $1350 for other size options. Regardless of which size you need though, you can get save $250 off the Puffy original mattress with our exclusive coupon. This already incredible price also includes free delivery, a 101 night sleep trial and it also has an astonishing lifetime warranty. 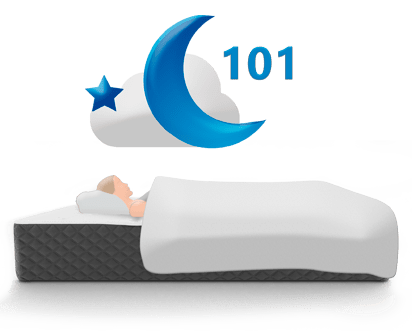 If you are in the market for a memory foam mattress that is ideally comfortable, slightly responsive and easy to move on, as well as doesn’t sleep overly hot, than look no further. The Puffy bed may be the perfect memory foam mattress for you. Get this USA made to order true memory foam mattress now at Puffy.com. And make sure to take advantage of our Puffy discount with the coupon link below! If you are ready for a mattress but your budget isn’t, don’t worry. Puffy also offers financing through Klarna. The first 12 months are even interest free, allowing you to pay off your mattress within the first year before accumulating additional interest fees. It is a super simple process that you can start right from mattress product page at Puffy.com. These easy one stop shopping allows you to have the buying power you need now. The delivery of the Puffy is what makes an online mattress purchase so simple and easy. The Puffy mattress ships free of charge with your purchase. Made in the USA, this bed is rolled and packed and sent via Fed-Ex to arrive in about 2 to 5 business days after your order is placed. It will show up right at your door and than you take it form there. Once your mattress is delivered all you need to do is get it to where it needs to go and remove it from the box and plastic. In a matter of minutes you will than have your new bed almost ready to sleep on. The mattress will show up in a relatively small box – for a mattress. However, it is 72 pounds and a little awkward, so having two people move it is best. When you get it to where it will be going you simply open the box and take the rolled mattress out. Position it on your frame or foundation and carefully cut the plastic off. It will then expand and start to firm up. This initially only takes a few minutes, but may take several hours before the foams firm up. And the truest feel of the foams may take a good 24 hours before fully inflating. See how easy the unboxing process of the Puffy mattress is in our video below! When setting up your new mattress you may be wondering if it needs a box spring or foundation. It will need a flat, even surface that will support the weight of the mattress as well as the sleepers. It also will need to be the right height for you as well as be aesthetically appealing. 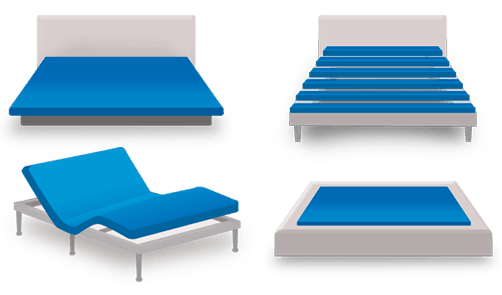 This means that the Puffy could sit on a variety of options ranging from an adjustable base, frame and box spring or even a platform bed. On top of that Puffy now offers their own adjustable base as well as Puffy Frame and Puffy mattress foundation, check them out at Puffy.com. The Puffy mattress would work great on any of the available options from Puffy or not. To find a foundation that would work for you check out our frames & bases reviews too. The Puffy mattress has a 101 night sleep trial period. This trial period allows for more than enough time to try this bed out. Giving you and your body roughly 3 months to adjust to the new and improved feel of your memory foam bed. It is good to note that you should take advantage of really testing this mattress during this time. Anytime you get a new mattress your body needs several weeks to even months to full adjust. If for some reason you get to the end of your trial period and it isn’t a good fit, no big deal Puffy will easily work with you to return and refund your purchase. This mattress has a lifetime warranty which goes above and beyond what the standard warranty for the mattress industry is. This warranty shows that Puffy really backs their product. Covering any abnormal defects or manufacturing errors. Minus the average wear and tear of a mattress. This provides consumers with the confidence that this is a mattress that the company will stand behind. 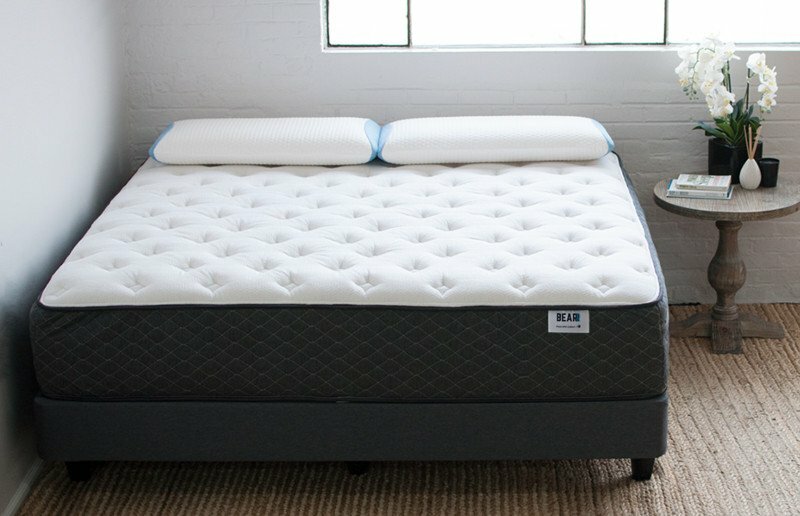 If you are looking for more specifics for the Puffy mattress trial period and warranty find out more at Puffy.com or for a helpful tool check out Our Mattress Warranty & Trial Period Guide. Also, Puffy not only has a great product but is a wonderful brand that gives back to the community. They make jumping on the bed a fun way to donate mattresses to children in need. Learn more about their “Jump for Kids” mattress donation program HERE! That’s right! 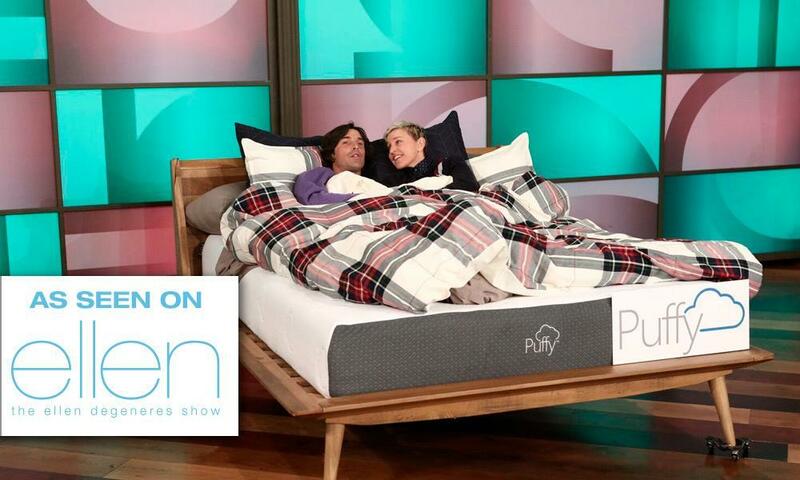 Ellen Degeneres featured the Puffy mattress on her talk show. If you were one of the lucky audience members that day you even got one for yourself. This brand really got a name for itself when they received such awesome exposure. As well as positive feedback from this iconic tv personality. The Puffy memory foam mattress was already popular, but this instant gratification sent this bed into new territory. With the Ellen show backing it and exposure all over the country, Puffy quickly became a big dog in the online mattress market. Don’t just take our word for it! See what these very satisfied customers have to say about their Puffy mattress! “Best mattress ever. I spent $3500 on my last mattress and like my puffy better. I’m 64 years old and have a degenerative spine issue. My back loves my puffy too!! !” – Jayne R.
“Great mattress!! I put one in my guest room for a friend coming to visit and he loves it so much he stayed an extra week to get more rest and is getting one for himself now. It was very easy for me to move myself into place and unwrap. Now that he left I am moving it to my room!” – Allison S.
“My cousin recommended this bed to us so we were expecting good thing from this bed. By surprise my hubby and I are actually blown away at how we cant feel any negative pressure throughout our bodies all night. It’s like sleeping on a light mold of air if that makes sense.” – Maria W.
“I used to have sleeping issues but now I sleep very deep and wake up feeling refreshed. On top of that, I live in Houston were it is crazy humid but this mattress seems to take in less heat.” – Tristan H.
“Process is easy! It is hard to purchase a mattress at the store, then I ended up with this awesome online shopping experience. I read through the reviews, saw the differences between the mattresses, choose the size of mattress, and in 4 days I was dreamin on a true luxury bed.” – Anita R.
Many customers noticed that the Puffy (prior to the changes made in early 2019) was a bit too firm for their liking. Before the added middle layer of ClimatComfort foam the Puffy wasn’t as suitable for side sleeping. However, now with the improvements this mattress is more ideal for all sleepers. We will be adding to this section once the newest version of the Puffy has had a chance to test the waters more. If you love the Puffy but want an even more premium mattress check out the Puffy Lux. This mattress is even more focused on relieving pressure as well as sleeping cool. Learn more in our Puffy Lux Review or compare these two side by side in our Puffy vs Puffy Lux Comparison. The Puffy mattress is a great choice! If you aren’t sure if it is the one make sure to read our Puffy Lux review too. Or compare both at the same time in our Puffy vs Puffy Lux Review too. Also, see how Puffy stacks up against other popular brands in our comparison reviews. Find the Puffy vs Purple HERE and the Puffy vs Casper HERE. Also, see the Puffy vs Leesa HERE and Puffy vs Cocoon HERE! And Puffy vs Nectar HERE and the Puffy vs Layla HERE and the Puffy vs Bear HERE. If you are looking for dense and durable memory foam mattress that is perfect for stomach and back sleeping. Or you like a true medium=firm feel the Puffy is a great choice. This mattress will provide great comfort and ideal support with innovative and beneficial materials. Still looking for some more information? Visit Puffy at puffy.com. Also, have questions for us? Please contact us and we would be happy to help you!